Exploring the world is a wonderful thing. New sights, new sounds…but also new dangers. You might experience injuries, or even worse, die. Touch wood, touch wood. However, that’s where your insurance plans come in to provide that peace of mind be it for yourself or your family. 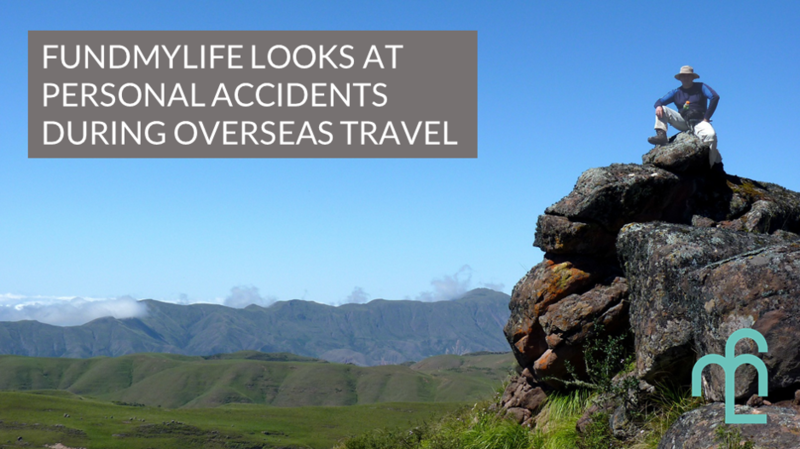 In this article, fundMyLife lists the things to know about personal accidents during travel and plans that cover them. When things go south, you should call your financial advisers to see what options you have, assuming you purchased a travel insurance/personal accident plan from him or her. If you bought travel insurance directly from the insurance company, there should be an international 24/7 hotline for you to call. The reason for that is to ascertain what you can and cannot do in an emergency. For example, some plans have emergency evacuation covers that you can claim if you ever need to be flown. Getting into a personal accident during travel is stressful and understandably you want to seek treatment ASAP. However, knowing what claimable treatment options you have will mean a difference between a peace of mind or an unexpectedly expensive trip. Haven’t found a trustworthy financial adviser? We gotchu fam. If you ever get into an accident overseas, don’t forget to document everything. As the number of fraudulent claims increase over the years, it is increasingly important to prove that your accident happened. From medical reports to pictures of the scene of accident, it makes sense to keep as much evidence as you can. While you might in distress and/or pain, it pays to take the extra effort and willpower to make sure you have black and white down. You wouldn’t want your case to be thrown out from a lack of documentation or proof. Evacuations occur when there are no medical facilities in your current location that can provide the required treatment. You will then be transported to the nearest place where you can seek treatment. The nature of evacuations differ depending on your location, and consequently cost differently as well. For example, if you’re stuck in the mountains, a helicopter will fly you out. However, take note that the doctor in charge decides whether you get evacuation, and requires the agreement of the insurance company. In addition to evacuation, there is also repatriation where you return home to receive treatment. How much does it cost? Evacuations can be surprisingly expensive, as it requires accompanying doctors, nurses, medical equipment and supplies, etc. According to a harrowing account of a family whose father experienced a heart attack while holidaying in Japan, the bill amounted to $250,000. As such, make sure you have enough cover for emergency evacuations and repatriation. On another note, make sure you purchase plans that covers preexisting conditions if you have preexisting conditions. In the case of the father with heart attack, his travel insurance did not cover anything as he had a pre-existing heart condition. As with all plans, there are exclusions as well. Firstly, there are exclusions in several countries that have high risks of danger. If you experience personal accidents during travel in those regions, you will not get any payout. Those countries have relatively higher risks of war/terrorism, e.g., Afghanistan, Iran, etc. That said, it does not mean that you’re in danger wherever you are in the country. After all, parts of these countries are inherently much safer than other parts. For example, you would visit Herat but not, say, Taliban-infested Kabul. However, you will have to purchase insurance that provides war and terrorism cover in those areas which mainstream insurance companies normally exclude. Secondly, plans have exclusions for relatively dangerous activities which are mentioned in the fine print. For example, travel plans do not usually cover activities such as bungee jumping, hiking or trekking above 3500m above sea level, diving deeper than 30m. If you intend to take part in such dangerous activities, it is important to buy insurance that specifically covers them. Be careful during your travels! Safety should always come first. That said, it is always good to know the important details if personal accidents during travel ever happen nonetheless. If you want a reliable financial advisers to be there for you when you experience personal accidents during travel, head on to our main site and ask our credible and incredible pool of financial advisers! By Cindy Teh, edited by Jackie Tan. Cindy is part of fundMyLife, the platform that connects financial planning questions to the right advisers. Happy 2018 everyone! In the spirit of “New Year, New Beginnings”, we here at fundMyLife would like to help you guys out with your 2018 travel plans. This shall be the year you’ll take your first (or second, or third…) step into the great unknown of international travel! Everyone wants to see the world, but there never seemed to be enough money for it. 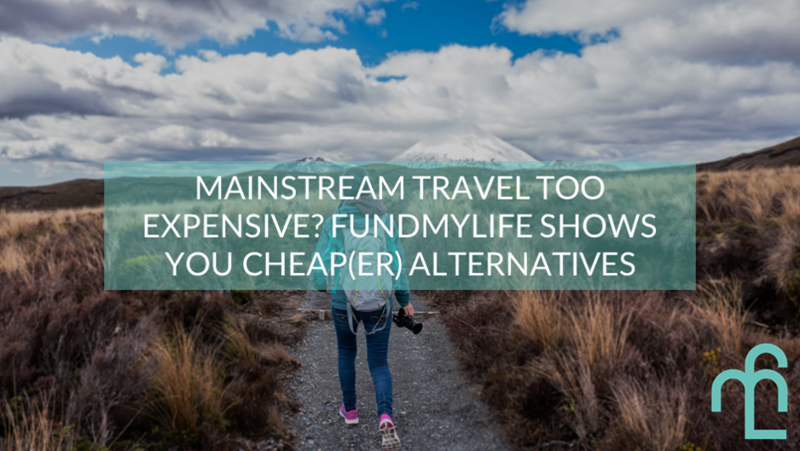 Some people think it’s expensive to travel – it can be, depending on the type of holiday you want. This article is for people whose desire to explore the world is bigger than their desire to have a “normal” holiday. We are talking about alternative ways of travelling, after all! Disclaimer: I’ve personally used all of these methods during my travels, so it can be done! As any frequent traveller would tell you, the 2 biggest expenses in travelling are air tickets and accommodation. If you can save on these two things, you’re already halfway there. Most airlines run sales a couple of times a year, and signing up for their mailing lists will ensure that you get good deals on cheap flights. Also, make sure that you are on the email lists of travel agents like Flight Centre or Expedia. They usually have members-only sales or flash discounts happening regularly. I’ve heard that the best time of the week to book air tickets is on a Tuesday afternoon, as that is when airlines drop prices on their fares depending on how empty their weekend flights are. It’s been a while since I booked a full price ticket anywhere. Save your money on the fare differences and use it on something more important, like food! Protip: If you have EXTRA time to spare, check out other ways of getting to your holiday destination, e.g., by bus or ferry or train. Sometimes they are cheaper than flying! Note: busing to Penang from Singapore takes 12 hours, while flying would only take you 1 hr 20 mins, so factor that into your plans. I travelled for a year without paying for accommodation. I did it by relying on the kindness of friends and strangers. I’ve been a member of Couchsurfing.com for over 5 years, and it works like Airbnb, except it’s FREE. You register a profile and book the dates of your stay with Hosts, and they choose to accept your couch request (or not), based on your request and profile. Both Hosts and Guests leave reviews on each other’s profiles after their stay, so the Hosts with the most number of positive reviews are also the Hosts who are the busiest. Even though it is called “Couchsurfing”, I’ve actually had my own bedroom pretty often. The important thing to note is that this is not a free hotel service. The whole point of CS is to promote culture exchange, so most hosts would make time to hang out with you or show you around the city, depending on how busy they are. Guests can reciprocate in any way they like; by cooking your host a meal from your own country, teaching them your language or a music instrument etc. I’ve made lifelong friends through Couchsurfing, and now I have a free place to stay whenever I’m in the area next. Protip: Use common sense. Only stay with Hosts with positive reviews, keep your friends and family updated of your whereabouts regularly, and leave the Host if you feel uncomfortable. So the next big travel expense would be FOOD. Who could resist trying out new cuisines on holidays? Especially if you’re a huge foodie like me! But come on, if you had so much money to spend on food, you wouldn’t be reading this article. But don’t worry, my budget conscious friend, there are a few things we could do to get around this. We can either eat simply, like getting bread and tuna from the supermarket, or we could cook, if we were staying somewhere with a kitchen, OR, you could set aside a food budget based on the cost of living in the country you’re visiting, e.g., you need a larger food budget in New Zealand compared to Indonesia. I am too lazy to cook, even though I’m usually staying at a place with a kitchen, so I do a combination of eating simple food + having a budget. Food portions in some countries (North America) are pretty big, so you could split them up into 2 meals. Protip: My favourite lazy budget meal is to get a pizza and have it for lunch and dinner. This is a money-saving solution even if you’re not travelling. But seriously, most of us have wardrobes that are bursting with clothes and shoes. Do we really need to do more shopping? Do we really need that “I <3 NY” t-shirt? Do we need to get 20x fridge magnets or other touristy souvenirs for our family and friends? Okay, maybe we do, so work out a shopping or souvenir budget and keep to it! Alternatively, DO NOT SHOP, do not spend money on anything that isn’t food, transport, or necessities. You can do this! Protip: This has become a lifestyle change for me. The less I buy, the less I need. Go figure. I am only referring to the ones where you have to pay to get in. Every city has museums, historic buildings, giant ferris wheels, zoos, aquariums, amusement parks etc… And every city also has amazing parks, bridges, rivers, architecture, rooftop bars etc that are free to get in. Choose a couple of attractions that you MUST visit, and save money on the ones that are “tempting but not really high up on the list”. Or get a tourist/season pass – those are usually value for money. Don’t forget some places offer cheepcheep discounts for students! Protip: Check Groupon or Travelzoo or similar companies in the cities you’ll be visiting for good deals on city tours/packages, restaurants, concerts, etc. After reading this, we hope that your eyes (and mind) are now opened to the myriad of cheap ways to travel the world. It IS possible to travel on a budget, if you are happy to try out alternate ways of travelling. Seeing the world provides so much benefits and opportunities for growth. With a little planning and organising beforehand, we can make any budget work for your next trip. Get out of your comfort zone and do something different this new year!